WASHINGTON, D.C.—House Republican Whip Steve Scalise (R-La.) joined Fox News Channel’s The Ingraham Angle last night to highlight how Democrats are beginning to enact their radical agenda. 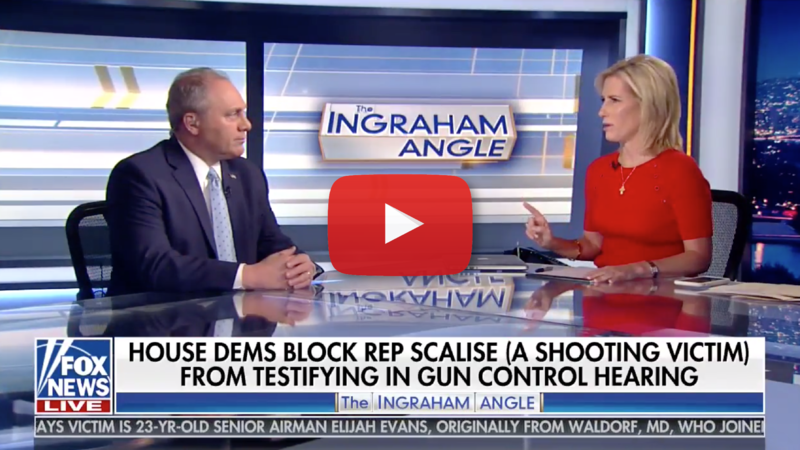 Whip Scalise highlighted the House Judiciary Committee Democrats’ refusal to hear his testimony during their hearing on gun violence legislation. Legislation being proposed would reduce Second Amendment rights for law-abiding citizens. Whip Scalise then stressed Democrats’ continued attempts to remove God from sworn oaths, a dangerous precedent. Click here or on the image above to watch the interview. “Go read their bill, H.R. 8. If you loan your shotgun to a friend of yours to go hunting, under certain circumstances in their bill, you could go to jail for a year and have a $100,000 fine. “Their bill would under certain circumstances actually allow that to be a felony where you could get a year in prison and $100,000 fine. Basically, if they think it was part of a gun transaction of you selling your gun or loaning your gun to somebody else. The gun-control is what they are trying to get at. They want full-gun registration. They want to take away your rights. If their bill would have passed, it would have done nothing to stop the shooting that happened in my case, the shooting that happened in Parkland, a lot of these other tragic shootings. It would take away the rights of law-abiding citizens to have a gun. “This is something new that Democrats are doing in their majority. Every House committee sets their own rules and the rules for swearing a person in. The Committee on Natural Resources last week literally tried to change the swearing in oath that you take to remove the phrase ‘so help me God.’ Republicans on the committee objected and they put it back in, but they tried to sneak it through. “Then, in the Judiciary Committee today, they tried to do the same thing that the Natural Resources Committee did. They literally tried to take away the phrase ‘so help me God.’ Again, Republicans called them out on it. [Rep.] Mike Johnson (R-La.) in this case called them out on it.